Community violence and police brutality have returned to the Mpumalanga township of Wesselton, just outside Ermelo, where it is alleged that the feared Tactical Response Team has become a law unto itself. Residents claim that beatings and humiliating rituals are the order of the day for the people of Wesselton, adding that the local SAPS office refuses to hear their cries for help. As the situation escalates, they are striking matches. By MANDY DE WAAL. 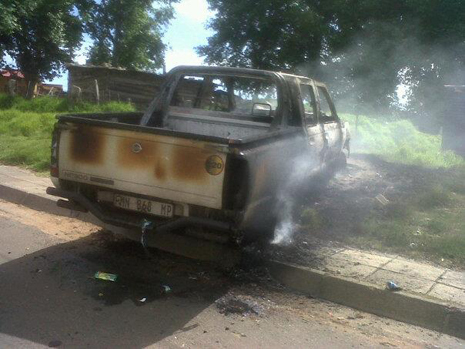 Residents of Wesselton in Mpumalanga went on the warpath recently, torching two cars to protest alleged police violence and the occupation of the area by the Tactical Response Team (TRT). “On Wednesday 05 December the people took to the street and torched two cars because they were angry with the Tactical Response Team. A few hundred, mostly young people, were protesting and poured petrol on both cars and set them alight,” Msukaligwa Concerned Committee (MMC) deputy chairperson, Dumisani Mahaye, reported to Daily Maverick. Mahaye said a woman was shot with a rubber bullet on the cheek. “The TRT wanted to arrest her grandson, and the woman wanted to know why, when she was shot in the face,” Mahaye said. He added that the Tactical Response Team had been a fixture in the township for well over a month now. According to Mahaye the police division, known in the townships as the “amaberet”, were deployed on and off in the Mpumalanga township during 2012, but moved in permanently during November; local residents heard they will be present in the area until mid-January 2013. “We don’t know why they are here, but our concern is how they behave in the community. Usually people hang out in the parks and every time when the TRT get people, they search them, they beat them, they pour liquor on them. These police sometimes they want all of the people to lie face down on the floor – like to sleep on the floor – and the police walk all over those people,” Mahaye said, before describing his experience with the Tactical Response Team first hand. “I was beaten by these police while I was in a club. The first time was on a Friday, when they came in and told the DJ to switch the music off. Then a man wearing a brown overall in the TRT screamed: ‘Face the wall. Face your future’. That is when the beatings started. If people weren’t quick enough, or they didn’t face the wall, they were in trouble. If the wall is full, people have to fall down and lie on the ground face-down,” the township activist told Daily Maverick about an attack which took place at a local night club called Dube Tonight in September 2012. “When they first got here I tried to talk to the TRT. I said: ‘Look, I don’t mind you searching me but…’,” Mahaye’s voice trailed off. He relayed how the TRT started to beat him even before he could get the words out of his mouth. “On Sunday they were back, but I knew how they work now. Some guy screamed and told the DJ to switch the volume off, and then the usual routine followed,” he said. “The TRT will slap you. They will kick you. They will punch you with the fist in the stomach. If they do not walk on the tables they walk on people’s bodies on the floor. And you don’t look at them. You don’t ask questions. You don’t say anything. If you look at them or ask questions they will brutalise you,” Mahaye told Daily Maverick during a telephonic interview from Wesselton. Mahaye further alleged that anyone who asked these police any questions about what was happening would be beaten up. “If you ask any questions the TRT will beat you up and they will say to you: “You are not in the position of authority here. We are the ones with guns here. Just do as you are told’,” the activist added. Mahaye said he was an eyewitness to another incident at a small shopping complex called Thembise in the township. “There are ten shops and a butchery and a bottle store, so the people, they hang out and braai their meat. They open the boot of their car, play music and braai. When the TRT got there they told everyone to face the wall or the floor. They made everyone do push-ups. After that the beatings started,” he said. “Ever since these police arrived there are ongoing complaints. It is happening almost every day now that people are traumatised; they have firearms pointed at them; people are hit, and our residents are getting very, very angry,” said Mahaye, who stressed that he condemned the torching of a security company vehicle and a Transnet vehicle on Wednesday 05 December 2012 when residents went on the rampage. “The problem is that the people are now getting so angry that they want to fight the TRT. They want to kill these police or to burn them, because we are making reports but nobody is listening to us,” Mahaye said. The Wesselton activist said affected residents had gone to the SAPS police station in Ermelo to lodge complaints against the Tactical Response Team, only to be told that the local police weren’t able to help. “If someone wants to open a case they are told to go to the Ipid (the Independent Police Investigative Directorate) offices in Nelspruit. The police here say they don’t have the power to help us. Now the community think that this is a way of trying to get the cases squashed,” said Mahaye. The Wesselton resident said that Nelspruit was located some 212 kilometres away from Ermelo, and that taxi fare to and from the city meant that locals would need R400 for a return trip. Mahaye said that people didn’t have the money to make the journey. Mpumalanga police spokesperson, Colonel Leonard Hlathi, said violent incidents the TRT were alleged to have been involved in had to be reported to, and investigated by, Ipid before he could comment. “One cannot just give a comment without any investigations being done. We have all the resources in place for people who need to make such a report, and such an incidence will be investigated by Ipid. I can’t make any comments until such time as these incidents are reported to Ipid, so these complaints can be levelled against the police,” Hlathi said. When Hlathi was advised by Daily Maverick that Wesselton residents were being instructed by local police to travel some 212 kilometres to Nelspruit to report the incidences of violence to Ipid, he was outraged. “Ipid has done marketing, even on radio, to say that you don’t have to go to them physically to report a case or uncalled for conduct. People can just phone them or get the number from Ipid,” the colonel said. “There is no reason for the local police to hide this information because Ipid is a legitimate body. There is no way the police can hide this information and I think that you can quote me to say that no police person has the right to hide the availability or existence of Ipid, let alone a number, to anyone who wants to lodge a complaint. The police can’t do that. They can’t do that,” Hlathi said. Wesselton was set ablaze during service delivery protests in February 2011 which set the stage for violent confrontations between residents and the SAPS. Mayahe and some 100 other residents were arrested and charged with public violence after municipal property to the value of R350,000 was damaged. After the protests, Mahaye and other activists were picked up by the police and allegedly tortured, with the aim of implicating senior provincial politicians who opposed Premier David Mabuza. Mahaye stated that during the brutality he was repeatedly smothered in plastic, had his head dumped in water, and tortured in ways that would make him stop breathing. Later video evidence of the SAPS abusing a local resident would come to light, and back up the activist’s claims of torture. David Bruce, a researcher at the Centre for the Study of Violence and Reconciliation, recently asserted that police action in Wesselton created a template for what was to follow at Marikana in August 2012. “In both operations, it is alleged that those who were involved in the protests were arrested, with a large number of them being tortured. After the Wesselton operation, this led to 25 charges of assault being lodged with the Independent Complaints Directorate (ICD). In Marikana, this led to 94 cases of assault being lodged with the ICD’s successor, the Independent Police Investigative Directorate,” wrote Bruce in Business Day. “In both cases, it is alleged that individuals among the police torturers focused on a specific objective. In Wesselton, it was to get confessions that political opponents of Mabuza had instigated the protests. In Marikana, the alleged objective of these torturers was to obtain ‘confessions’ that former ANC Youth League leader Julius Malema had instigated the protests,” he added. Bruce added that the SAPS could no longer be trusted to play a nonpartisan role in politics and stated that “a culture of political deception, manipulation and intimidation that extends to the use of assassination as a political instrument” would be in force in SA. Bruce’s picture of the future is one where the police stand back when members of the ruling party are violent, but actively target dissidents. Back in Wesselton, Mahaye heard that the police wanted to pick him up in connection with the latest protests. “The police hit people in the street to try to try get confessions about the protest. They want someone to confess and to point out another person, and then they go and find that person and beat them up too so as to get more confessions,” Mahaye said during the phone interview. Twenty Wesselton residents were arrested after these latest riots, amongst them four youths between the ages of 14 and 16. “Someone phoned me to say that I am on the list of the people that must be arrested, and that the police say that I am the instigator for the riots last week. But no. I am not. This time I am not involved, but still they think I am the one,” Mahaye said. The activist no longer sleeps at his home and lives in fear because of the trauma of his alleged torture experience. He says he fears that if he is apprehended by the police again, he will be brutalised. 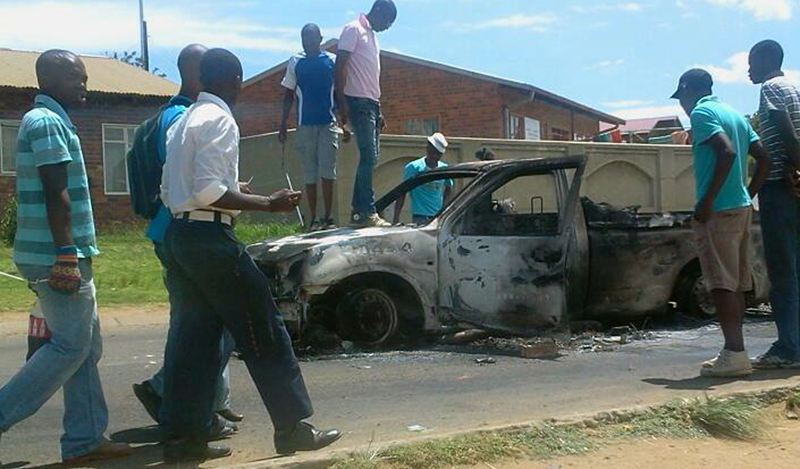 Photos: All photos are taken by mobile phone at the scene, depicting the cars burnt by the angry community.